Delhi is no fairytale city but a city where dreams come to reality. Its strategic location was one of the prime reasons why successive dynasties chose it as their seat of power. Delhi is truly a symbol of the old and the new; a blend of ancient well preserved monuments and temples along with jam-packed burger joints and upmarket shopping malls. The city is lushed with a plethora of temples, forts, mosques as well as parks, gardens and beautiful colonial mansions. Delhi may seem daunting to a first time visitor but as a national capital and the gateway to the North, it is a must visit city on any travelers itinerary. 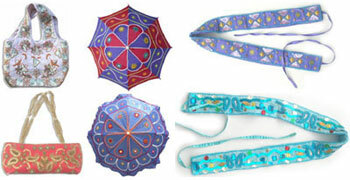 Impressive museums and interesting nightlife, Delhi has a lot to offer for everyone. The earliest reference to a settlement at Delhi is found in the epic Mahabharata, which mentions a city called Indraprastha, built about 1400 BC under the direction of 'Yudhistra', a 'Pandava' king, on a huge mound somewhere between the sites where the historic Old Fort and Humayun's Tomb were later to be located. Although nothing remains of Indraprastha, according to legend it was a thriving city. The first reference to the place-name Delhi, seems to have been made in the 1st century BC, when Raja Dhilu built a city near the site of the future Qutub Minar and named it after himself. One of the most fascinating aspects of Delhi is the visibility of its historic past. Some of the large portions of the city could be well earmarked as archeological parks because the rulers of successive dynasties between the 13th and the 17th centuries established seven cities in different parts of Delhi. A chronological review of these cities fortunately also serves as suitable itinery for tourists and highlights the important monuments amongst the 1300's. Delhi's History goes much further back in time than the 13th century. The core of the first of the seven cities was created by Anagpal Tomar who is said to have built LAL KOT, which is the first known regular defence work in Delhi. The Chauhan Rajput's later captured Delhi from the Tomars. Prithviraj III, also known as Rai Pithora, extended Lal Kot, adding massive ramparts and gates and made Quila Rai Pithora the first city of Delhi. Today only, the ramparts are visible near the Qutub Minar, though the city is known to have had several Hindu and Jain temples. Soon afterwards, in two successive battles of Tarain 1191, the Rajputs first managed to hold off an invading force from Afghanistan, led by Muhammad Ghuri but surrendered a few months later. Unlike other invaders of Central Asia who swept into the northern plains, Muhammad Ghuri came to stay and not only plunder. After Ghuri's assasination in 1206, his provinces, forts and monuments were kept intact in the hands of his Turkish general, Qutub-ud-din-Aibak. Qutub-ud-din was the founder of the Slave or Mamulak dynasty also known as Delhi Sultanate and became the first Muslim ruler of Delhi. He also raised the construction of Qutub Minar. His successor, Iltutmish, was arguably the greatest of the early Delhi Sultans. The Slave Dynasty (1211-1227) was followed by the Khalji dynasty (1296-1316) and during the rule of Ala-ud-din Khalji, the second city of Delhi was built - "SIRI". Today Siri is situated where the Siri Fort and the modern day Asiad Village Complex are located. The third city of Delhi - TUGHLUQABAD was founded by the Tughluq dynasty soon after in 1320 AD but very little remains of this can be seen in present day Delhi. The fourth city of Delhi - JAHANPANAH was built between Lal Kot and Siri in 1327 AD. The next Sultan Firoz Shah built the fifth city of Delhi - FIROZABAD in 1354 AD. The Tughlaq's were followed by the Central Asian Turk-Timur, who was later succeeded by the Sayyid dynasty. The Lodi dynasty soon followed and the only interesting architectural features added by them were the tombs, the best of which may be seen at the Lodi Gardens. The famous battle of Panipat fought in 1526 AD marked the beginning of Mughal rule in India, a period in history that was very significant. Babur and Humayun were the early Mughal rulers followed by a 15-year break in Mughal rule when Sher Shah Suri an Afghan king ruled over Delhi. He built the fort DIN-PANAH - the 6th city on the banks of the Yamuna, which in present day Delhi is known as the Purana Qila. When Emperor Akbar took over, the capital was shifted to Agra. However in 1628 AD, Delhi was once again made the capital of the Mughal Empire under Emperor Shah Jahan. In Shah Jahan's rule, Delhi witnessed the construction of some of the finest pieces of Mughal architecture. There was the new walled capital of SHAHJAHANBAD - the 7th city of Delhi, which is now Old Delhi with the Red Fort and the Jama Masjid. For the next many decades, Delhi witnessed tumultuous times, different rulers and dynasties and finally in 1803 AD, the British who had already established their presence in India, took over power in Delhi. 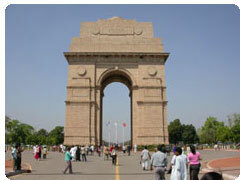 Delhi was the focal point for the first war of independence in 1857. Though the revolt did not reach its desired conclusion, Delhi became a thorn in the eyes of the British. As the Britishers shifted their capital from Calcutta to Delhi, all the activities during the freedom struggle were directed towards Delhi. Thus, Delhi also bears the marks of the freedom struggle. The ultimate goal of the Azad Hind Fauz during the freedom struggle was to capture Delhi and established Swaraj. The slogan 'Dilli Chalo' is still used by leaders and political parties when they oraganise any rally or demonstration. It was the hosting of the tricolour at Red Fort in Delhi, which marked a chapter in the history of India. In 1950, Delhi was made the capital of Independent India and in 1992 it was declared a state. 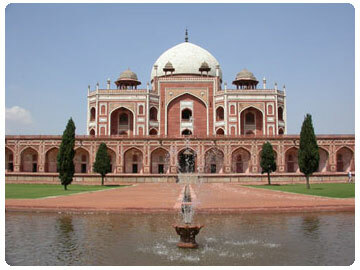 "Delhi is a must visit city on any travelers itinerary"